As a Son of Nor, consecrated by the Goddess of the Night, you are all that stands between the human race and total extinction. Only one human enclave remains in the vast desert world of Noshrac, a hidden refuge called The Edge. After 400 years of peace, humanity's ancient enemy the Sarahul appears once more, forcing you into an adventure to save your people. Armed with telekinesis and terraforming, the gifts granted by the goddess Nor, you will explore the world of Noshrac, fighting through enemy territory and uncovering long-forgotten secrets. On your journey you will discover mysterious structures created by an ancient race that are filled with puzzles and traps - and the key to mystical powers unlike any you've ever seen. 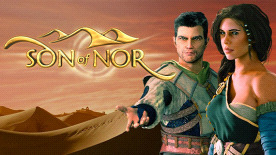 Become immersed in the world of Son of Nor: no GUI or HUD, everything is embedded naturally and intuitively in the world's environment.